I've learned so much from other photographers, either via the internet or in person, that I thought it might be good to give back. So, every now and then as I think of them, I'll pass along little things I've learned about buying, owning, using, servicing and re-selling old film cameras. If just one person reading my blog finds just one of these tips useful, I've done good. One thing you'll find out pretty quickly when acquiring vintage film cameras that use batteries is that different cameras use different kinds of batteries. Some cameras, like the Pentax Spotmatic, use Mercury batteries, which have been banned for environmental reasons. It could have been foresight on the part of the engineers who designed the Spotmatic or just plain luck, but those old Spotties have a bridge circuit that allows you to use modern 1.5 volt batteries instead of the original 1.35v Mercury cells. The modern batteries are a bit smaller in diameter than the Mercury cells, so you have to buy ones with little rubber grommets around them. I use Renata 387 batteries in my Spotmatics. There's nothing worse than deciding to head out for a day of film photography only to find out that the battery in your Canon A-1 is dead and you don't have a spare. Or, picking up a cool old camera on eBay and when the package arrives, you find you don't have the right battery. After facing both issues, I now make it a practice once every year to make a list of all of the battery types commonly used in my old film cameras, no matter if I'm out or not. 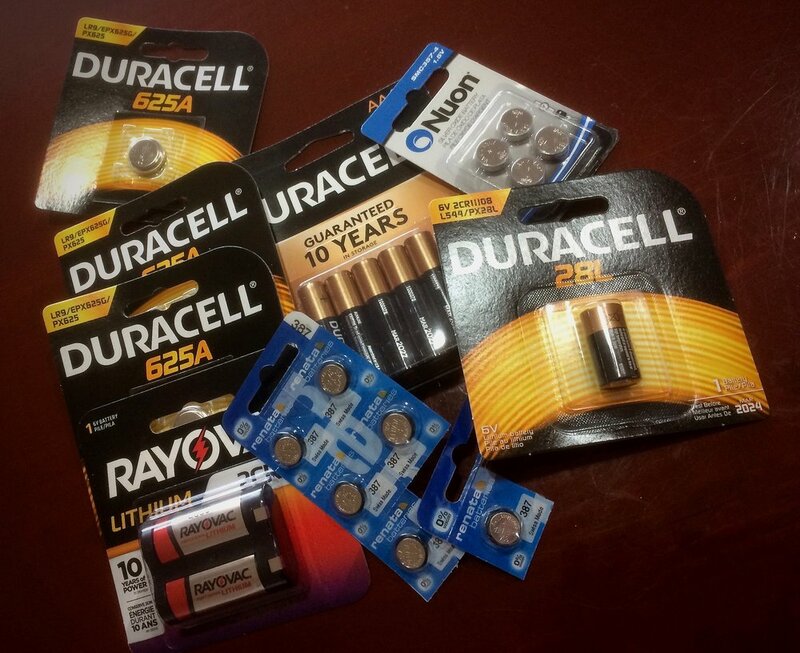 I then head over to the Batteries+ store and pick up a few of each. You can do it online too, but I like supporting my local franchise store. It's also nice to do an actual retail transaction with another human being standing across the counter from you. I then store each battery type on one of those little plastic drawer cabinets you use for screws, nails, bolts and such. Over the years, I've built up a nice, dependable supply of most of the commonly used film camera batteries. I even include a fresh battery in the package when I sell one of my old cameras, which always pleases the buyer.